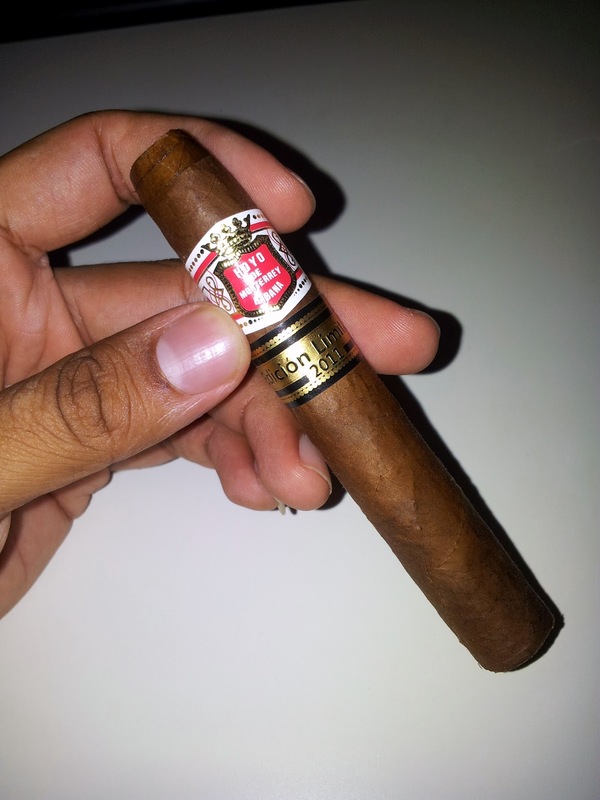 One of the first releases of the Habanos Edicion Limitada 2011 was the Hoyo de Monterrey Short Hoyo Pirámides. This elegant Pirámides stands firm with few visible veins on its dark wrapper. Its raw smell gives off a pleasant woody leathery composition with a slight hint of chocolate which is familiar to most aged tobacco leaves. First burn gave a harsh woody note and a strong peppery taste that hits the back of the throat quickly. 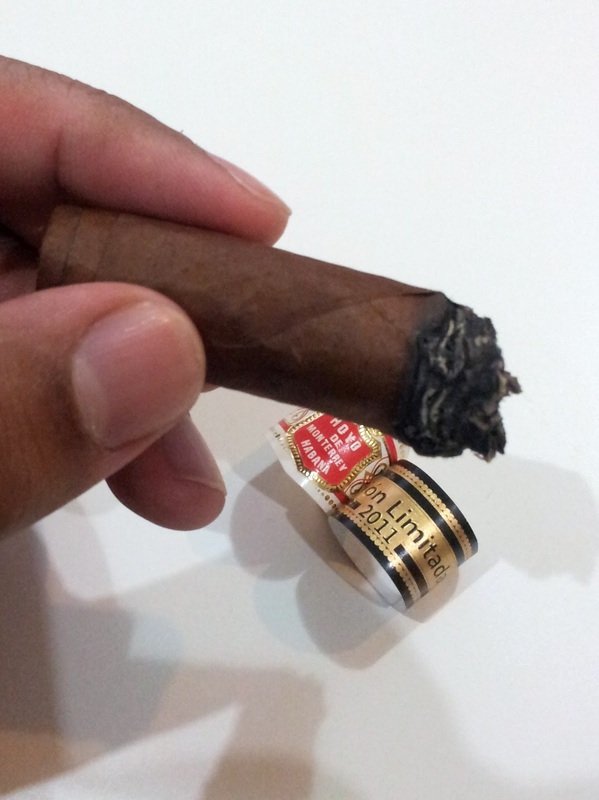 The draw is easy and light despite the firm roll of the cigar and the smoke is very smooth. As it mellows, you clearly sense the peppercorns and a slight leathery aftertaste. Half way through the Short Hoyo Pirámides that peppery tastes fades away but is still kept in the background while a spiced woody notes starts bounces off our pallets. Here is where the meduim body cigar shows its characteristics, the mellowing out of flavors and the smooth draws gets the complex elements noted. The smoke turns to a creamer texture and the dark grayish ash is well held together. The final part of this cigar marries all the flavors well, the leathery woody taste with a hint of pepper complemented with a smooth somewhat sweet smoke makes the Short Hoyo Pirámides a very enjoyable cigar indeed. 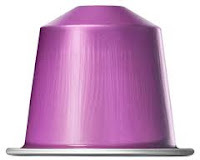 Nespresso pairing will have to be with a meduim intesity blend like the Capriccio (intensity 5) which has a light acidity with cereal notes to uplift the peppery and woody notes of the Short Hoyo Pirámides. 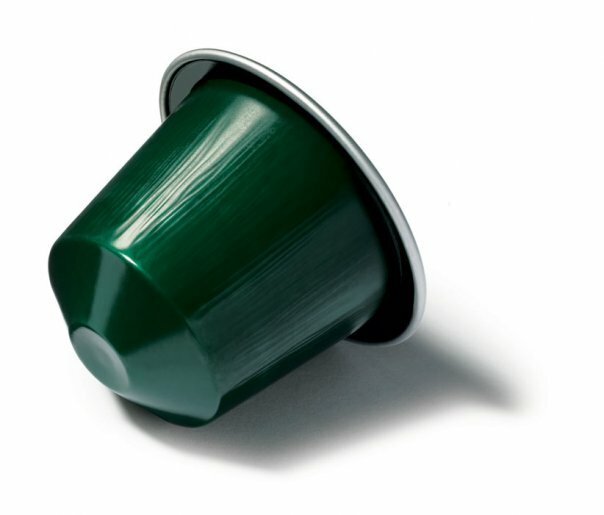 Otherwise the Livanto (intensity 6) can balance the flavors its sweet and fruity profile. 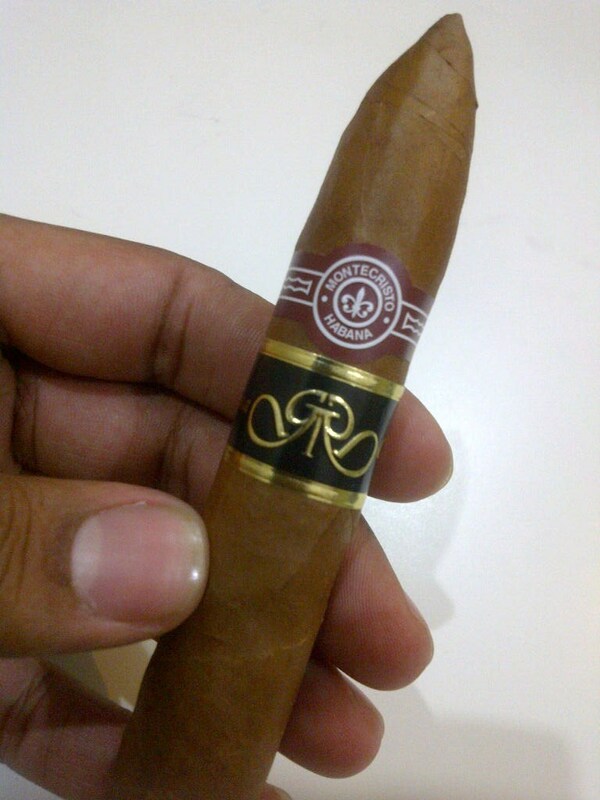 "Habanos S.A. presents the first Gran Reserva of Montecristo, manufactured in which probably is the most widely appreciated brand of Habanos, in the Montecristo No. 2 vitola, the most emblematic of the brand. With a limited production of 5000 numbered boxes of 15 units each, all the leaves have been aged for at least 5 years. This new Gran Reserva digs deeper into the unique character of Habanos as Protected Appellation of Origin. For the production of this Gran Reserva of Montecristo, the best tobacco leaves were selected fromVuelta Abajo*, Cuba*, harvested in 2005. All the leaves that make a Habano, filler, wrapper and binder, were aged during a long and careful process of at least 5 years. 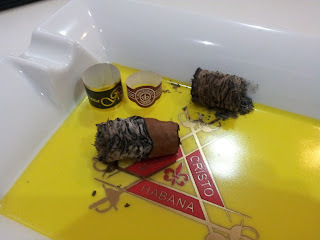 These were no less than 5 years of care, control of the evolution of the aging of these precious leaves that, finally, in the master hands of the experienced Montecristo cigar rollers in the H. Upmann factory take shape to create a unique Habanoto satisfy the pleasure of the most demanding smokers. 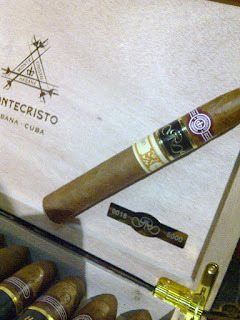 The emblematic Montecristo No. 2 vitola has been the one chosen for this unique production that makes the Gran Reserva of Montecristo." 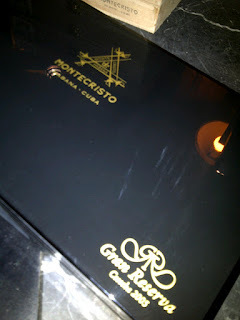 After waiting almost a year since the announcement of the Montecristo No.2 Gran Reserva Cosecha 2005 (which means 2005 Harvest) at the XII Festival del Habanos 2011, I finally got a hold of these beautiful cigars last February 2012 from P.G.C Hajenius in Amsterdam! They came out of box Lucky Number 18! From the 15 cigars only 8 left in the box and sadly three of which were bruised so I ended up saving the final 5 pieces. These babies were conditioning in my humidor for 3 months now and on the 1st year anniversary of Me & My Cigars is where I decided to smoke one. The first close up examination you notice the smooth wrapper with no visible veins and a slightly firmed rolled of the Gran Reserva. The fresh out of them box smell gives a hint of sweetness and cocoa which is very inviting. First burn of the Montecristo No.2 Gran Reserva showcases a very smooth easy draw with a slight woody scent but with a nice sweetness to it. The smoke is fairly light and the aromas of cocoa are left in your mouth. These characteristics of flavors are not what I am used to in Montecristo so it is very interesting and appetizing. As I reach the second part of the Montecristo No.2 Gran Reserva, the mellowness of flavors and rich smoke continues to amaze me. Richness of chocolate and nutty sense give this blend a very delicious flavors and really shows how sweet the aged tobacco turns out to be. This cigar can be a fairly quick burn but at this stage I am taking my time with it to savor every flavor I can pull out of it. 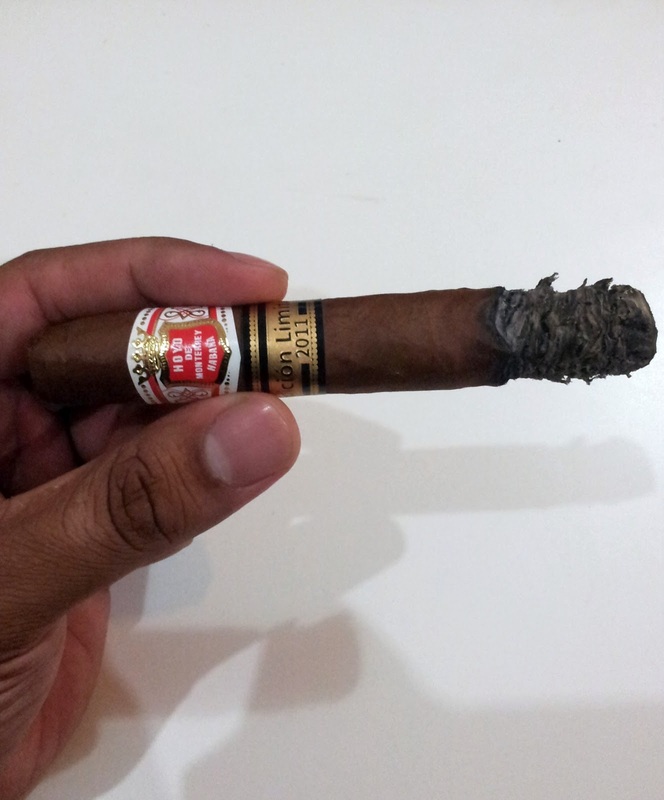 Ash keeps firm and intact which indicated how this cigar is constructed perfectly. The Interesting third & final part - The Gran Reserva pulls in a few complex characteristics here, a sense of sweet cedar and spiced wood comes through over powering the first cocoa flavors but leaving the nuttiness behind and making it really rich medium bodied cigar. The smoke continues to be smooth and creamy while the ash keeps tight and firm. The left over taste and tingle in the mouth is another indicator of the character complexity of this unique blend. Unlike other Montecristo cigars, the Gran Reserva brings new flavors to the brand and uniqueness of the blend really puts this Montecristo on a whole different level. It will make it a perfect item to age and that is what I plan to do once I get a hold of some more. 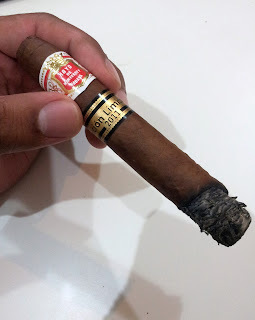 It is a perfect cigar and true and amazingly wonderful to smoke until the last tip! As always, pairing my cigars with the perfect espresso roast is challenging. Yet I have found a new brew that will surely complement the Montecristo No.2 Gran Reserva Cosecha 2005, the Nespresso Limited Edition 2012 Naora. Nespresso Naora Limited Edition 2012 is a Grand Cru of intensity 5. Harvested after a longer and strictly controlled ripening period which offering sweet notes of blackcurrant and blueberry with an incredible long-lasting flavor of pure Colombian Arabicas. It will complement the Montecristo No.2 Gran Reserva by balancing the sweet and nutty characteristic of this beautifully crafted blend. Happy Birthday to Me & My Cigars! 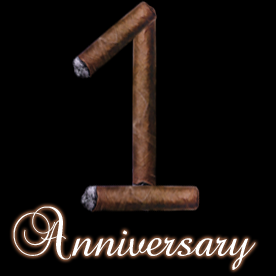 On this day a year ago, I started blogging to share my experiences and passion for cigars. Even though it has been a tough year, when I look back at it, I am glad that I took this decision and wouldn't want to change a thing! The best part is having readers from all across the globe, spanning from Brazil all the way to China which amazingly shows how diverse this community is. It gives me greater respect and deeper appreciation to what we are into... Cigars! To complete this celebration, tonight I will be smoking the first of my MONTECRISTO N.2 GRAN RESERVA COSECHA 2005 then to be followed with my review. Most Popular Post - My Surprise Birthday Cake! 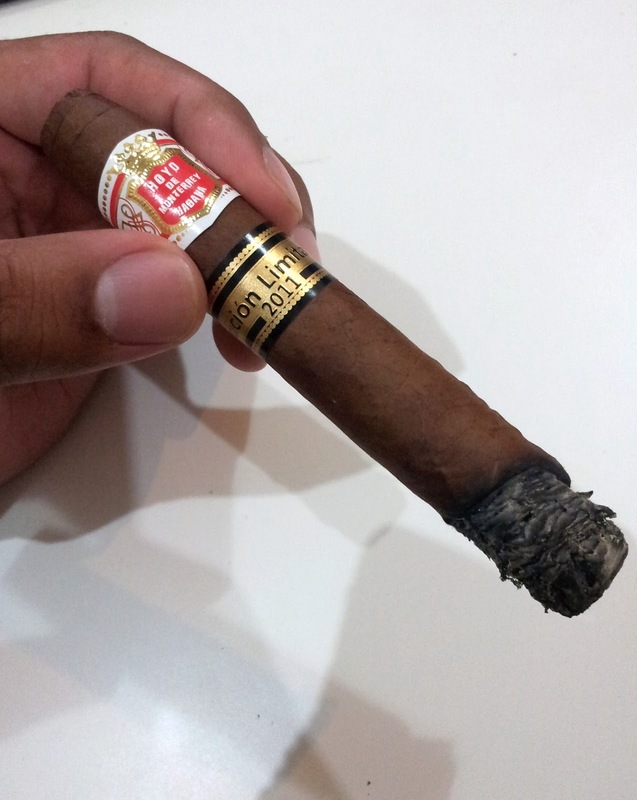 Most Referred to Post - Fake or Real Cuban Cigars? How can you tell.. Finally, I would like to thank each and everyone of my fellow readers and frequent visitors YOU GUYS ROCK! I also would like to thank all who supported me, advised me, challenged me, envied me, criticized me and mostly judged me, you all just gave me more reasons to push forward!